Google officially announced its second-generation Nexus 7 last month and the slate is already on sale starting at $229. 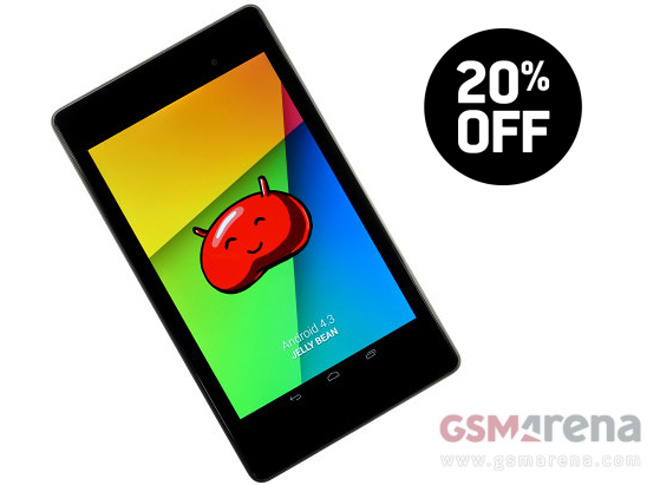 Now, the new Nexus 7 is available at a discounted price from Office Max for a limited period. Office Max is currently offering a 20% discount on the 16 GB and the 32 GB variant of the new Nexus 7 tablet. The 16 GB variant now costs you $183.20 and the 32 GB version is up for grabs with a price tag of $216, which saves you $54 as compared to the official pricing. The offer requires the usage of a coupon code that is available in the source link below. It’s an in-store only kind of deal, though, so you can’t have the discounted tablet shipped to your place. The specifications of the New Nexus 7 include a 1920 x 1200 resolution display and the tablet features a Snapdragon chipset with 1.5 GHz quad-core Krait processor. The slate has 2 GB of RAM, 5 megapixel rear camera, 1.2 megapixel front camera and runs on Android 4.3 Jelly Bean. For more information on the new Nexus 7, check our hands-on impressions here. The offer is valid until August 10, so you better hurry, if you want to take advantage of it.